A French 75 sounds a little sweet for my taste, but I might just have to try one the next time we've opened a bottle of bubbly without managing to finish it. Wine – English couple in the opening scene are drinking wine at the outside cafe when robbed by a sly pickpocket. Cocktail – A desperado is waiting, waiting, waiting and drinks while lamenting that he will never get out of Casablanca. Cocktail – Man tries to negotiate a passage out of Casablanca. Cocktail – Englishmen are served by Sascha in Rick’s bar, and toasting cheerio. Wine – Ugarte drinks while bargaining with Rick. Brandy – Captain Louis Renault drinks at Ricks. He’s a steady customer, since the bar also has loose women. Brandy – the Italian Fascist Captain Tonelli drinks while harassed by Lieutenant Casselle in Rick’s. Brandy – Rick gives some free brandy to Renault in Rick’s office. Veuve Cliquot 1926 – The top French champagne that Renault recommends to Strasser as the Nazi crassly gobbles caviar. Wine – Resistance member Berger drinks wine at the bar as Laszlo and Ilsa walk into Rick’s. Cointreaux – Laszlo orders two for himself and Ilsa as their first of many drink orders in Rick’s. Champagne – Captain Renault orders “a bottle of the best” when invited by Laszlo to join him and Ilsa at their table. Champagne Cocktail – Laszlo orders one he joins Berger to conspire at the bar. Champagne Cocktail – Renault orders for himself and Laszlo at the bar as Berger flees. Champagne – Renault orders some for Rick when Rick joins the Laszlo party. Champagne – Rick opens a bottle of champagne in Ilsa’s flashback room in their happy liaison in Paris. 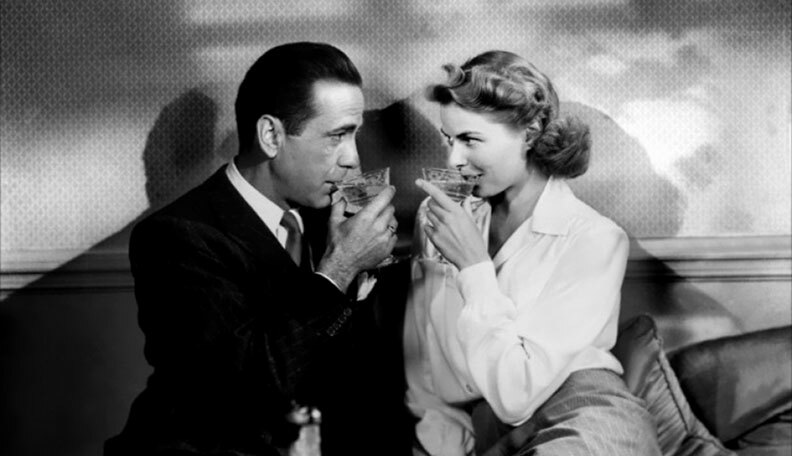 Wine – Rick and Ilsa drink in Paris at the Cafe Pierre. Champagne – Rick, Ilsa, and Sam hastily guzzle three bottles of Mumm Cordon Rouge as the Nazis occupy Paris. “The Bourbon” – Ferrari demands his special bourbon in his own bar, the Blue Parrot, when Rick arrives to negotiate. Somehow, Rick refuses the bourbon, saying he never drinks in the morning. Wine – The pickpocket toasts another sucker in Rick’s before he robs him. Brandy – Rick is drinking heavily on the second night in his club and Renault joins him for a brandy. French 75s – The cocktail Yvonne orders when she comes in as the brand-new floozy of a German officer. A “French 75” is an American drink named after a caliber of French artillery in World War One. Champagne – Strasser and fellow German officers are joined by Renault while living it up for the second night in Ricks. Brandy – Carl serves brandy to the Leuctags to salute their escape to America. Brandy – Rick offers brandy to Annina (Bulgarian refugee girl) as she prepared to prostitute herself to Renault to save herself and her husband. Cognac – Laszlo orders for himself and Ilsa the second night in Rick’s. Brandy – Rick continues drinking recklessly at his own bar. Champagne – After the publicly defiant singing of the Marseillaise, Lazslo and the French officers toast the humiliation of the Germans. Champagne – Ilsa and Rick drink in Rick’s room the second night. Whisky – Rick doses Laszlo with medicinal whisky after Laszlo gets roughed-up while escaping a police crackdown on the Resistance. ,P> Vichy Water – Renault pours himself this non-alcoholic drink of this after Rick has shot Strasser, but in a symbolic act drops Vichy into the trash.